Previously there was no way to copy data from one entry into another entry. 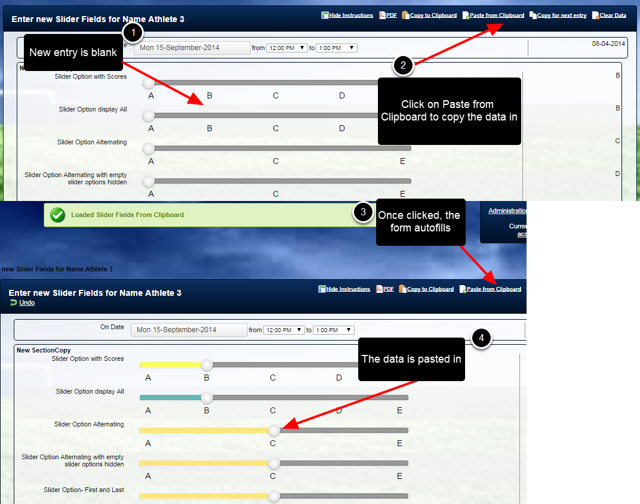 Copy and paste functionality can now be set on a Event Form by Event Form basis according to your needs. If copy and paste is available for that Event Form, the data in one entry can be copied to a clipboard and then pasted into a new entry for the SAME Event type. For example, you cannot copy data from a daily wellness entry to a weekly wellness entry, but you can copy it to another daily wellness entry. N.B. The copy and paste works for forms with Database and Related Entities in them. N.B. It is not available in each form by default; Medical data should not be able to be copied from one athlete to another. At the top left of a new entry, the copy to clipboard and copy for next entry buttons may appear (if they have been enabled). Zoom: At the top left of a new entry, the copy to clipboard and copy for next entry buttons may appear (if they have been enabled). 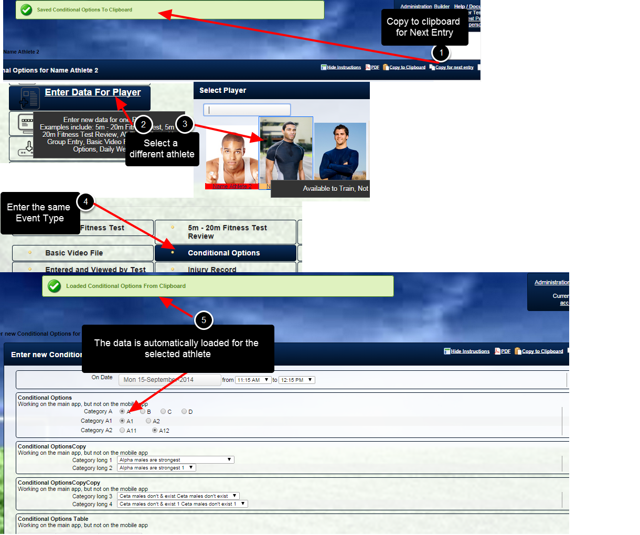 Once all of the data is entered into an entry for the athlete, click on "Copy for Next Entry". Save the Form and choose another athlete or another entry for the same athlete. N.B. 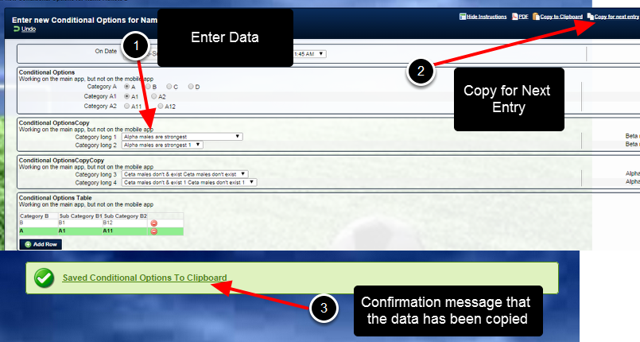 You can open an existing saved entry and copy the data from that form as well. 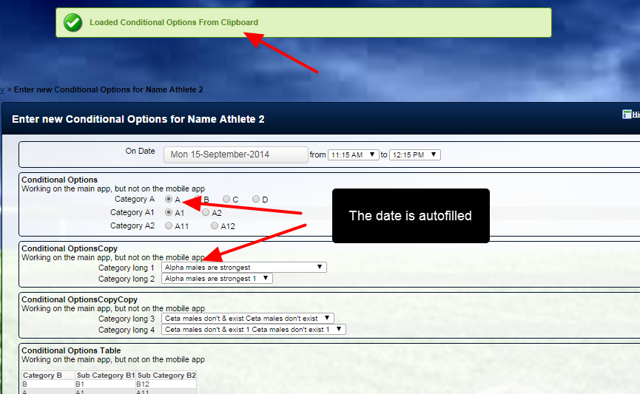 Once you have auto-filled the next entry, the data is not longer available to auto-fill other entries; for that athlete, or for any other athlete. The clipboard is essentially blank. Remember that once the data is auto-filled for this athlete, it will not be available to auto-fill any additional entries. You can reselect the copy for next entry for this athlete if you require. When the same event type is selected, it will not be auto-filled. Click on "Paste from Clipboard" to paste in the copied data. Zoom: When the same event type is selected, it will not be auto-filled. Click on &quot;Paste from Clipboard&quot; to paste in the copied data. As long as the user doesn't click Copy to Clipboard or Copy for Next Entry when the enter in data into the other Event types or for other entries, then the Clipboard data can be copied into an Event Type and still paste in the data. If data was copied to the clipboard for a daily wellness form, and a user then copied to clipboard a weekly monitoring form's data, the daily wellness data would be wiped, and ONLY the weekly monitoring data would be available to paste into another weekly wellness form. Please keep in mind that the Copy and Paste functionality can only store one Event Form's data at a time. 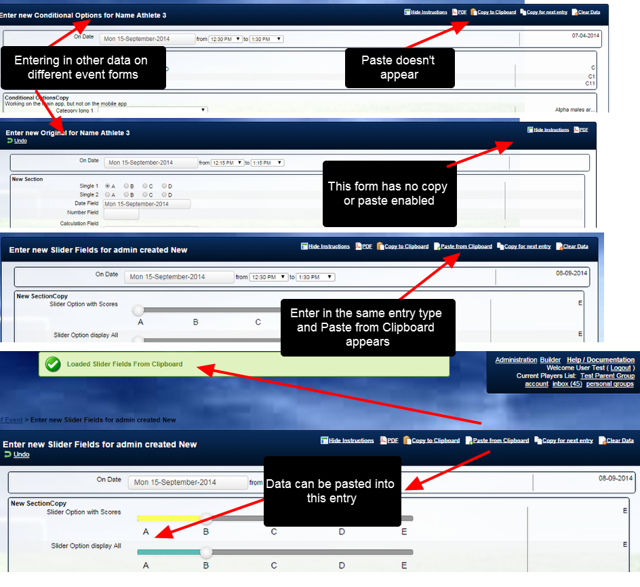 You can however enter in multiple event types, and as long as you do not click on "Copy to clipboard" or "Copy for next entry", then the data will be available to paste the next time you enter in data for the event form that you have copied the data for. The "Clear Data" button will wipe all of the data entered into the event form. Zoom: The &quot;Clear Data&quot; button will wipe all of the data entered into the event form. If a user makes a mistake and pastes data, or does a copy to next entry, and get the wrong athlete they can simply click on "Clear Data" to clear all data entered into the Event Form. If a user mistakenly clears the data they want, they can click "Undo" to reverse the clear. 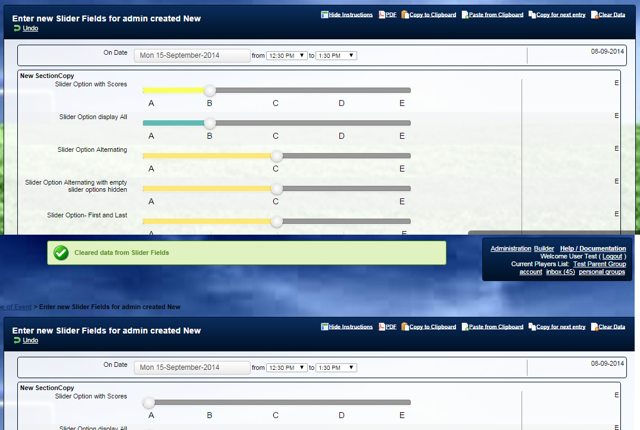 Zoom: If a user mistakenly clears the data they want, they can click &quot;Undo&quot; to reverse the clear.